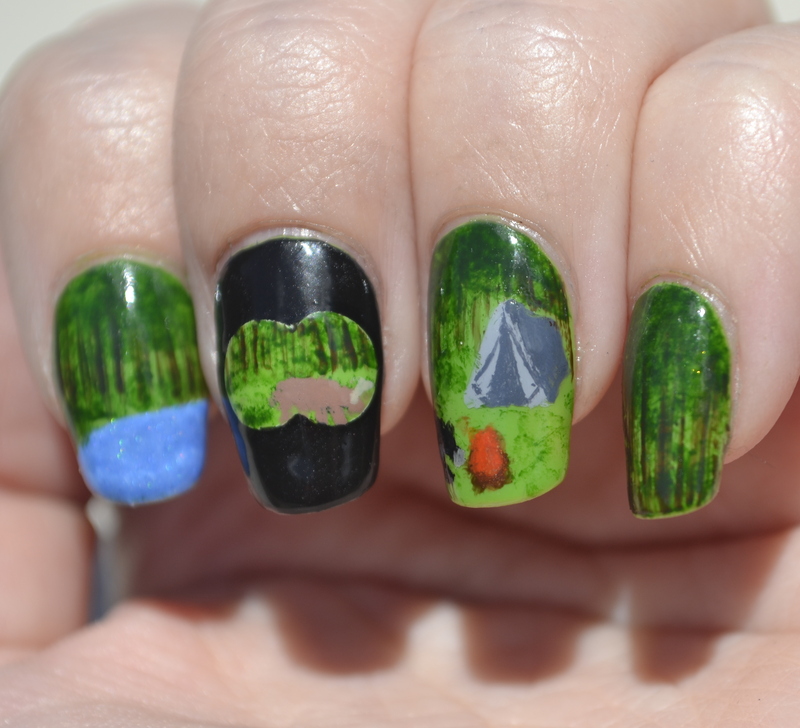 August 30, 2014 / Rachel C.
Day two of this month’s Challenge Your Nail Art camping theme! I had fun with this one! The theme was nature, and I tossed a few ideas around during my initial planning before deciding to stick, again, to some pretty basic nature scenes. 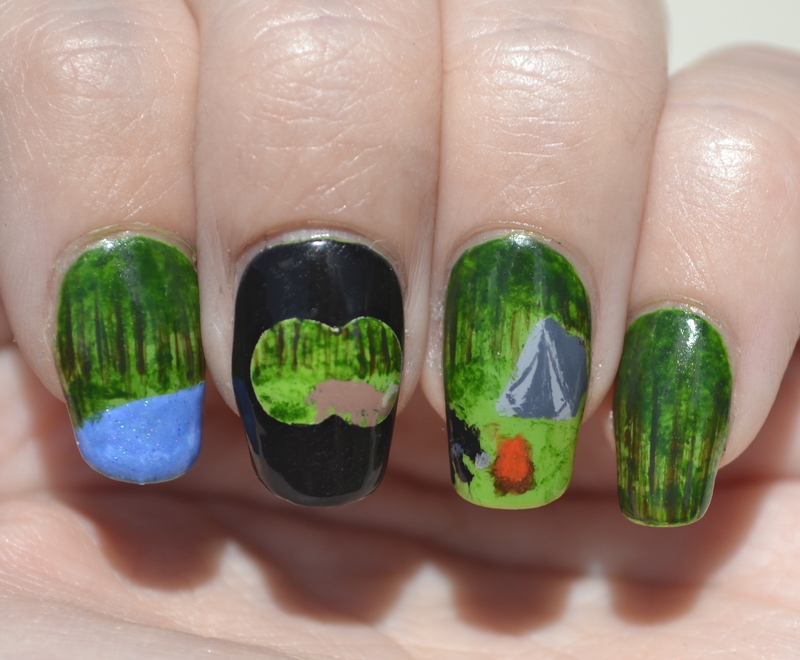 So as you can see, I have a forest lake scene on my index, a view of a deer through binoculars on my middle, a black bear wandering onto a campsite on my ring, and a forest on my pinky. Okay, maybe not too basic, but they certainly aren’t intricate either. Lots of colors were used for this, the main three being China Glaze Gaga for Green, Zoya Louise, and an unknown green that I found in my sister’s horrifyingly disorganized stash. Gaga for Green was the background color for forest scenes, and the other two were also used for creating the forest. ALIQUID Lacquer I’m Heading Strait to Mackinac (with an undie of FingerPaints Paper Mache) was used for the lake (it sparkled like water in the sunlight! ), while Kleancolor Black was used to make the binocular view and a mix of Zoya Louise, Flower Go With the Flow-er, and Kleancolor Brown were used for the deer. The camp scene on the ring finger used the main three, plus Kleancolor Black, Flower Go With the Flow-er, Zoya Carey, Kleancolor Concrete Gray, Kleancolor Tangerine Burst, and China Glaze Orange Marmalade. Whew, that was more than I realized! I am definitely pleased with the overall effect here. Sure there are issues–I somehow gave my bear a horse’s muzzle and my binoculars are off center, for example–but so long as you don’t scrutinize the details like I do, these are actually kind of cool. Growing up in Central Florida, I do think of forests and the local woodland creatures (whitetail deer and black bears for the larger ones) when I think of nature, so I’m happy that I was able to portray that for this challenge. And while I myself have never gone camping further than my own backyard, I thought it appropriate to have the camping scene to honor the month’s challenge theme. 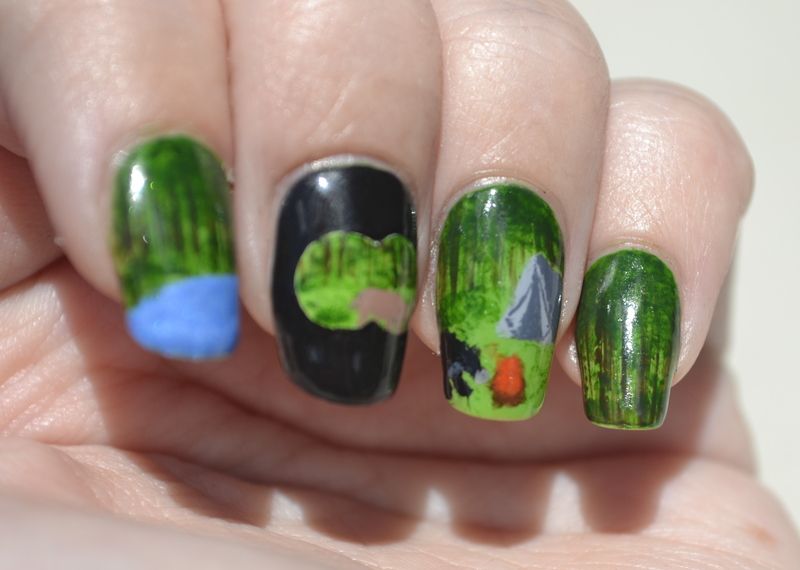 I think my favorite scene, though, is the lake nail. I’m Heading Strait to Mackinac was definitely a great choice for the water! So what do you think? Nature-y enough for the challenge? 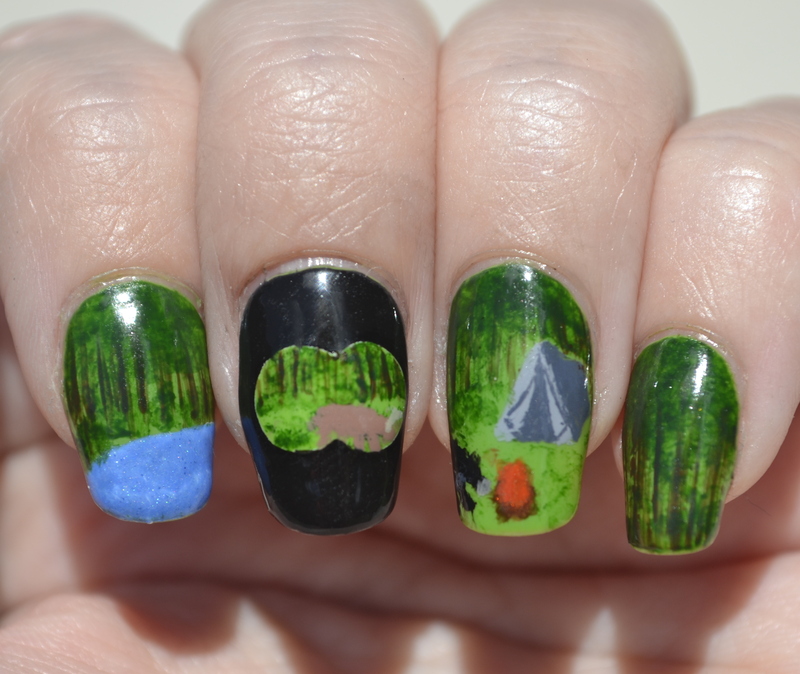 And don’t forget to click the button and go check out the other nature nail art submitted for the challenge! I would call that some intricate nail art, well ok maybe not intricate but very detailed! Love the idea of looking through binoculars. The tent is amazing, it looks like real fabric! This is way cool! Are you still in Central Florida? I’m in Port Orange! Love these! Especially the binocular view!